On January 29, the Ninth Circuit issued an important decision clarifying what can and can’t be included in the background check disclosures mandated by the Fair Credit Reporting Act (FCRA) and California’s Investigative Consumer Reporting Agencies Act (ICRAA). In Gilberg v. California Check Cashing Stores, LLC, the Ninth Circuit concluded the disclosure provided by California Check Cashing to the plaintiff was neither sufficiently “standalone” nor “clear” – two key criteria in sorting out these disputes, which have become an easy target for class actions due to the fact employers distribute disclosures to all employees and applicants. When it comes to failing to meet the standalone requirements of the FCRA or the ICRAA, the Ninth Circuit deemed that the financial institution’s error was that it referred to rights under state law that were inapplicable to the plaintiff, as well as to extraneous documents that were not part of the FCRA-mandated disclosure. The court additionally reasoned that the disclosure was unclear because a poorly worded, incomplete sentence constituted language that a reasonable person would not understand and by combining federal and state disclosures together, it would confuse a reasonable person. On the other hand, the court held that the disclosure was sufficiently “conspicuous” – a third criteria – because its section headings were capitalized, bolded, and underlined, and the font size was legible. According to Nilan Johnson Lewis attorney Veena Iyer, inattention to small details regarding background check compliance can result in large financial burdens. “Plaintiffs are limited to actual damages if the violation is negligent but can recover statutory damages up to $1000 if the violation is willful,” said Iyer. 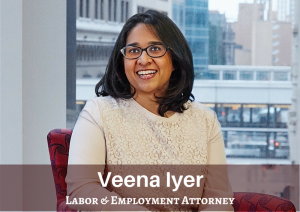 “In the event of a class-action dispute when hundreds if not thousands of background check disclosures have been issued, it can result in devastating losses, so we recommend employers closely scrutinize their background check disclosure forms – including those created by a background check vendor – to ensure information is formatted, collated and worded correctly.” Contact Veena Iyer at viyer@nilanjohnson.com or 612.305.7695.